How many members of my generation know what a Victory Garden is? Not many, and I'd lay money on that. I'm not a gambling person, so that should tell you something. Here's the "official" Wikipedia definition: Victory gardens, also called war gardens or food gardens for defense, were vegetable, fruit and herb gardens planted at private residences and public parks in United States, United Kingdom, Canada and Germany during World War I and World War II to reduce the pressure on the public food supply brought on by the war effort. In addition to indirectly aiding the war effort these gardens were also considered a civil "morale booster" — in that gardeners could feel empowered by their contribution of labor and rewarded by the produce grown. 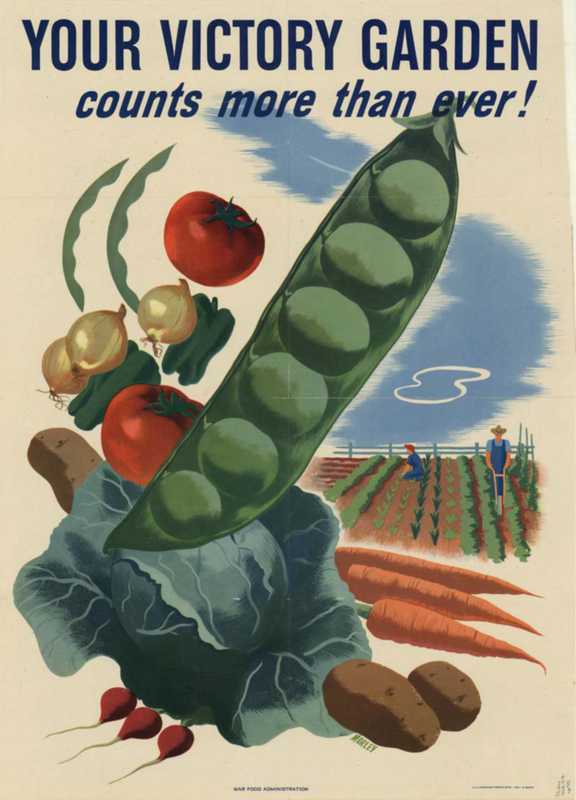 This made victory gardens become a part of daily life on the home front. When you think about it, home gardens really are morale boosters. When a friend of mine came to stay with us this last year, she was on the verge of depression. She actually fought me for the privelege of picking asparagus and raspberries because it made her feel good. Having our own gardens lets us know where our food is coming from. We know it's not coated in pesticides. We can be relatively certain (if we're using heirloom seeds) that it's not GMO. That's the true "home front." Think about walking down rows of tomatoes. You can smell the leaves as you brush past them, see the ripe and ripening fruit, and you can pick one and eat it right there. It's perfect--an heirloom tomato, ripened in the sun and nestling in your hand. Taste it with me: warm and slightly dusty on your tongue as the sun beats down on your head and you listen to the breeze blowing through the garden. Your teeth pierce the skin, and maybe some seeds run down your chin, but you laugh right after you say MMMM. You stand there and savor it for a moment. It tastes like summer and EXPLODES with flavor. It's not like supermarket tomatoes that look really pretty but when you eat them, they're tasteless mush. You grew this yourself. You can take pride in it. You take JOY in it. Think about a truly fresh chicken egg (and yes, it used to be standard practice to keep some chickens in your city backyard in the 1950s). Many people haven't ever HAD a fresh egg. The eggs you get from the store are usually about a month old, produced from confined hens, washed in filth. Finding out that supermarket eggs are washed in a chlorine solution that quickly becomes soiled with chicken poo and broken eggs but is not quickly replaced really opened my eyes. (mind you, the natural "bloom" on an egg is water-soluble. So, we're taking off the natural anti-bacterial coating of the egg to bathe it in chlorine and diluted poo that will penetrate the egg?!?) I was skeptical too until my hens started providing me with the most gorgeous fresh eggs I'd ever seen. The yolks are darker because I pick the chooks fresh greens to eat every day. The whites are firm and "stand up" because they're fresh (I write the date it was laid on each one of my eggs). They taste like EGGS, not like a pale, chlorinated imitation. And while these chookies are giving me these beautiful nuggets of nutrition, they're making compost for our garden. Win, win, win. You see, gardening is a constantly evolving process. You try what you know. You try new things. You combine those into what works for YOU. Nothing can be more empowering than that, especially when you're rewarded with fruit for your labor. Two years ago, we gardened with no pesticides. Today, thanks to some wonderful people who wrote great books, we're expanding into areas that we'd never considered before. Next year, we might have a new idea. Take it, tweak it, make it work for you. Folks, that's victory. Each time you take your kids out to your garden (no matter how big or small) to pick their veggies for supper, you win. Your kids win too because they'll be healthier for it . . .and maybe want to have their own gardens. Each time you let them help slaughter and process your own chicken, you win, and so do they because they know just where their supper came from. People have become so out of touch with the land (and being stewards of it and giving back to it instead of just taking from it) that they've started losing. Take the lead. Grow a Victory Garden. Be VICTORIOUS.